I’ll assume you read the first post in the series. The initial note to delete Payroll is only seen on TestTrack – you won’t want to undo anything on the real exam as no scoring is done until the exam is completed. Actually from the last question we know iSCSI0 only has 10GB after being extended, so we need the space to come from somewhere else. So we need the space to come from somewhere. There are two iSCSI datastores other than iSCSI0 – iSCSI1 with one VM (177KB in use) and iSCSISharedVMs with 5 VMs and two templates. The easiest way to get more space for iSCS0 is to move the one VM off of iSCSI1 and onto any other datastore, delete iSCSI1 and add that LUN as an extent to iSCSI0. 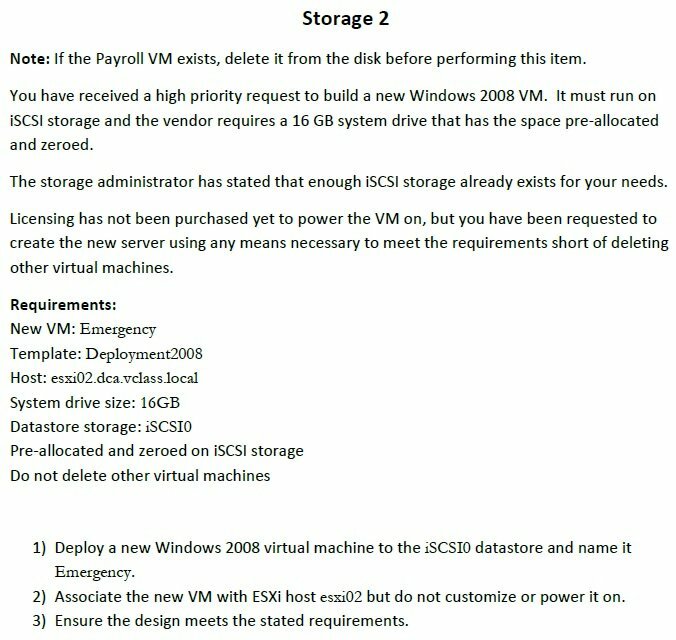 This makes iSCSI0 ~20GB and the new VM can then be created. Note that the new VMDK needs to be thick eager to get all the points. Note that the third point requires the completion of one of the other points as well . This prevent it being a free point if the item is skipped. This entry was posted in Certification, Computing, PowerShell, Scripting, Storage, Virtualization, VMware and tagged certification, vcap, VCAP-DCA, VCAP5-DCA, VCAP6-DCV, VCIX. Bookmark the permalink. "300 out of 500" : What is a passing score?